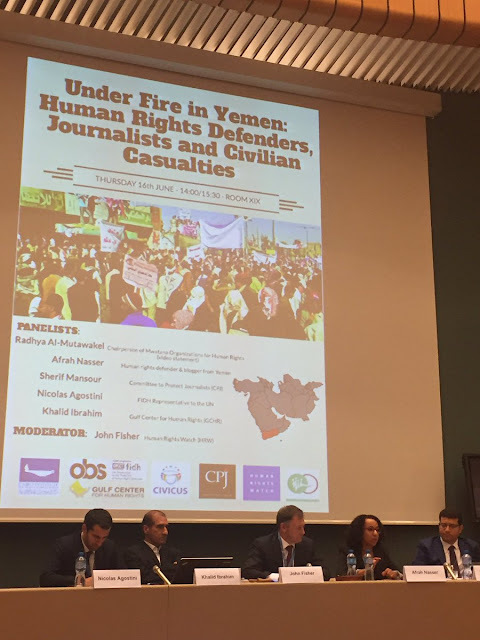 June 18, 2016 - This is the second year I am invited to speak about the war in Yemen at a side event during the UN Human Rights Council annual session, co-organized by the Gulf Center for Human Rights. Nothing has changed since last year except the expansion of the catastrophic humanitarian situation, an increase in the atrocities committed by all warring sides, and the UN failing Yemeni children. With the UN’s withdrew of Saudi’s name from the child rights blacklist, the UN has lost its credibility. I feel very pessimistic that there’s any meaning of me speaking here, but I’m here today only because it has been extremely difficult, if not impossible, to get Yemenis from inside Yemen traveling to come here and speak to you. I was able to be here only because I had to seek political refuge in Sweden where I live today. Yemenis’ mobility is extremely difficult and can be impossible for them to get a visa to travel abroad, and even to seek refuge in neighboring Arab countries who are members of the Saudi-led coalition. Yemenis are trapped, while the world doesn’t bother to care. 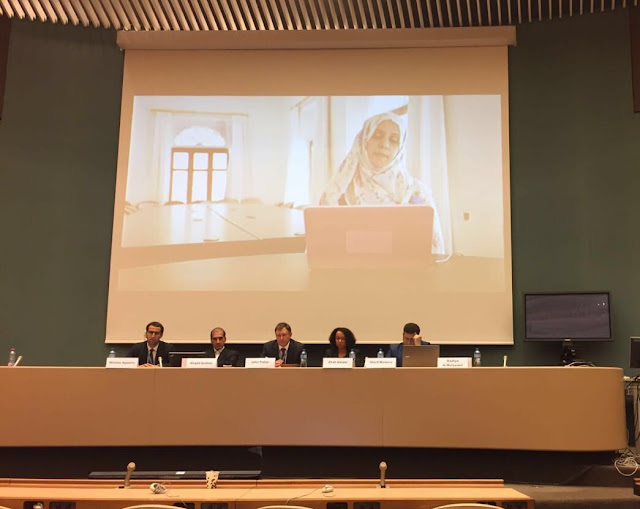 Mwatana‘s Radhya Almutawakel should have been here with us, but it’s been a mission impossible to help her travel with the never ending obstacles for Yemenis to get a visa to travel to anywhere. Despite her absence, the youtube clips she sent us, illustrating the grave human rights violations in Yemen were a smart solution. Watching these clips break my heart because I know that every single Yemeni house has a similar heartbreaking story as they are affected by the killing and the violence. Today in Yemen, if the violence doesn’t kill you directly, the lack of food, water and medicine will kill you. 80% of Yemen’s 26 mil population are in a dire humanitarian situation and struggling to stay alive. Nowhere else in the world today, you have millions of people in need of water, food, medicine, electricity shelter, like the situation in Yemen. I wish we see this as if the country was hit by an earthquake, so perhaps the world can rally to help us. All warring sides are responsible for this situation. The Houthis/Saleh coalition and the Hadi/Saudi-led coalition are both to blame. However, two wrongs don’t make a right. Million of Yemenis’ lives is at stake, as we are busy blaming this or that side. We must support any peace agreement, immediately. Yemenis must join their efforts to stop this war and work together in bringing peace, yesterday before today. 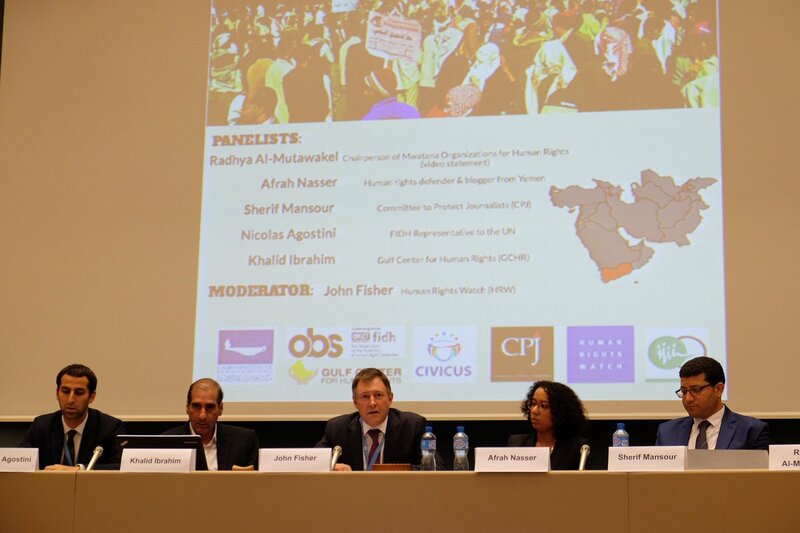 For the UN to regain its credibility, it has to prioritize the survival of Yemenis. 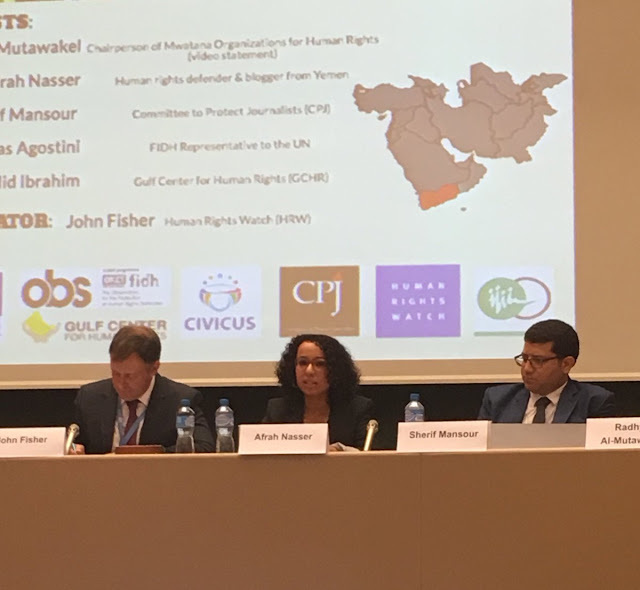 The international community must consider the catastrophic humanitarian situation more seriously and exert efforts to allow unrestricted delivery of humanitarian assistance and commercial goods to all Yemenis. It also has to do whatever it takes to support the ongoing peace talks in Kuwait. The UN must continue in its attempts to implement the UN Security Council 2216 resolution and also adopt a new resolution against any individual or groups that are hindering the possibility for a peace process in Yemen. *This piece was originally published on the Huffingtonpost, June 20, 2016.